Where was the UK Terrorism Victims Tribute at E3 2017? Skipping Windows 10: VINDICATED! Paint: DEPRECATED! ...Hm, that looks a bit front-of-the-month-loaded, but, hey, all the articles are worth reading. Every one. On the whole site. Continuing July's apparent theme of “once-liked things are dying”, image-hosting website Photobucket has changed its business model during July. Photobucket is notable for being one of the first, premiere image-hosting sites early on the Internet, and it was free. As a result, it has had incredible popularity among the early 2000s crowd, accumulating billions of images. That includes all of KoopaTV's staffers. We have saved many images on Photobucket because it was one of the best ways to share images with one another back then, especially on forums. 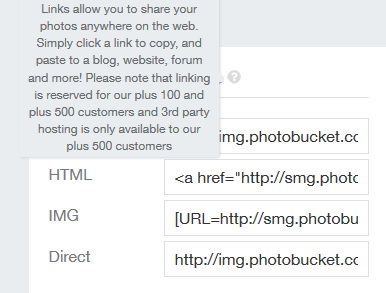 Just LINKING is reserved for paying customers. Photobucket is basically holding their existing user base hostage. KoopaTV has made a spreadsheet of all of the Photobucket references on our site, and we have fixed... most of them. There are some cases where Photobucket urls were referenced in a live reaction log. We didn't swap those out because that would be tampering with historical documents. Let's transition to the section that's all about YOU GUYS. Here are the standings for Round 15 of the KoopaTV Loyalty Rewards Program as of publishing. It ends August 30! If you want to win a $10 Nintendo eShop code by participating (and being the top-scorer) in a 100% skill-based contest, you'll want to check this out. Reminder: KoopaTV's Feedback Forms and Quizzes are a great way to get points quickly, and I know that most of you haven't filled out the current set. There were no corrections made to KoopaTV articles, as pointed out by KoopaTV readers, during July 2017. ...That's good for us. You can trust us to keep the facts straight! 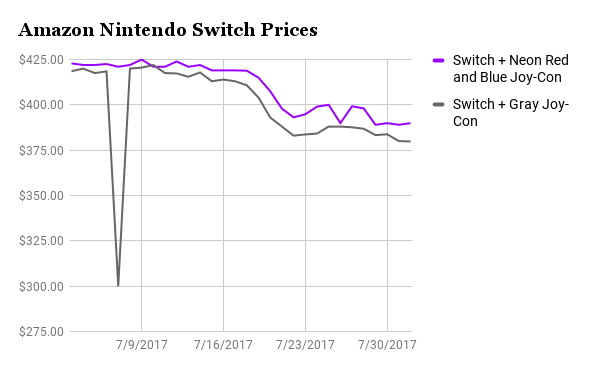 In July, we started a new KoopaTV feature: Daily reporting of Amazon's Nintendo Switch prices for the two SKUs. I decided I'd give the results in these newsletters. Will the prices keep gradually falling as they have in the last third of July? You really should share KoopaTV to your friends and discussion partners. That would make the staffers happy. You want KoopaTV's staff to be happy, right? Regardless of what you want, KoopaTV's staffers will work this month to make YOU happy with awesome, free content! Click here for last month's June 2017 newsletter. Click here for next month's August 2017 newsletter. Click here for last year's July 2016 newsletter. Click here for next year's July 2018 newsletter. I filled out the quiz and feedback form this time. Not completing them could cost me first place as I learned the last round. And woooooosh you're in first place right now.